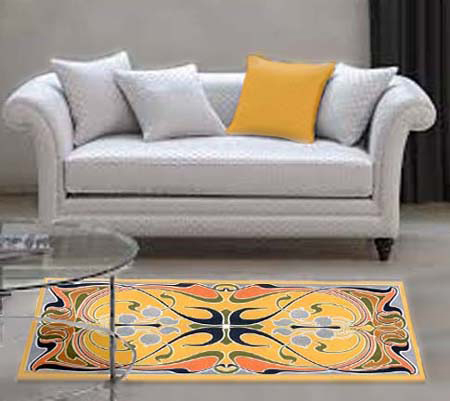 The designs for these needlepoint area rugs were inspired by the first truly International Style… ART NOUVEAU. As the 19th century was drawing to a close, a luxurious new style was taking Europe by storm. 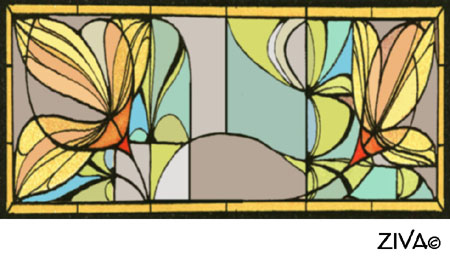 This was the fin de siècle, and the style was Art Nouveau. 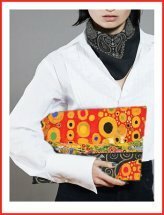 Feminine and luxurious, it is one of the most easily recognized design styles with its use of exotic materials, rich colours, sinuous contours, whiplash curves, asymmetrical lines, and shapes inspired by nature. 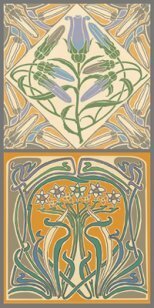 For Art Nouveau designers and craftsmen, it was the first internationally based attempt to transform visual culture according to modernist ideas… a revolution in name of truth, beauty and nature. These ideas found public expression in the progressive architecture of such visionaries as Belgian architect and interior designer, Victor Horta, French architect Hector Guimard, and many others. In Brussels, the avant-garde work of Victor Horta epitomizes the total integration of a design theme into a sinuous structure and all of its details. The stair rail and painted wall decoration, the mosaic flooring, light fixtures, hardware and door handles are elements of his total design. Such a complete visual environment was a thoroughly modern design statement, one that placed contemporary man in a fully contemporary setting. 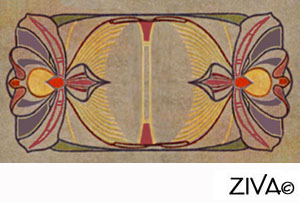 These area rug designs from ZIVA with their natural sinuous contours and whiplash curves are adapted from original Art Nouveau designs. Their fluid floral themes are typical of the period and still add an elegant touch to today’s interiors. 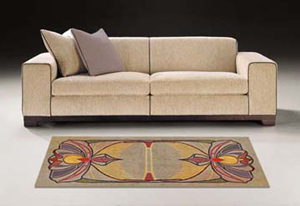 All the area rugs are available in 3 widths to suit your décor: 24”, 30” and 36” wide (60 cm, 76 cm and 91 cm wide). Contact me if you are looking for a custom size. 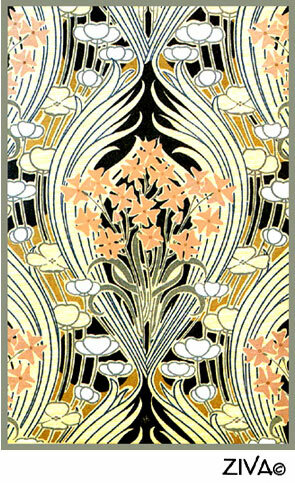 We’ve adapted this Art Nouveau motif to create a delicate, rhythmic stained-glass-styled area rug, called ‘Day Lilies’. 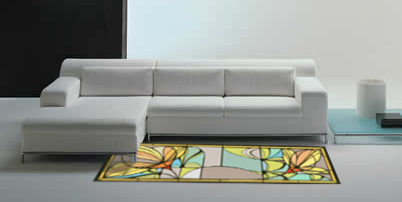 The two fluid asymmetrical day lilies have been placed at either end of the area rug bridged by curvaceous abstract leaf shapes. A fresh, subtle colour palette! The warm day lily colours range from soft yellow, gold and orange-yellow to gentle coral-oranges. They are contrasted with a cool colour palette of gentle greys, blues and greens for the leaves. 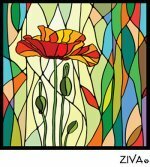 The classic Art Nouveau natural curves of the motif are bound by a bold stained-glass border design. Also available as a cushion design! If you like this pattern, but want to stitch something less ambitious, have a look at this motif we re-worked for a cushion design, called Saffron Day Lily. The fresh lively colours together with the flowing natural lines of day lilies motif create an elegant accent for this neutral contemporary space. The bright, sophisticated blossoms of the freesias in this design twist and intertwine in classic Art Nouveau style with fluidity and grace. 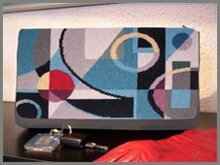 They elegantly adorn each end of the area rug. The colours have been updated from the original design to suit today’s interiors. The white flowers create a perception of the freshness of spring, and are surrounded by cool blue and pale turquoise curves and whiplashes. 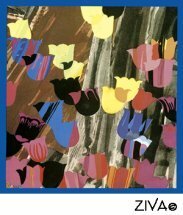 Fine black and light grey outlines throughout delineate the flowing silhouette of the flowers. I’m delighted how beautifully the new colours have created an area rug that works well with the cool neutral palette of a contemporary space. It creates a dynamic accent to this modern interior… contrasting its soft curves to the hard edge contemporary shapes of the furnishings. An exemplary marriage of style and periods! 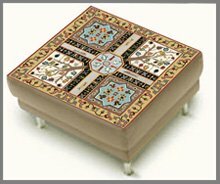 We adapted this exquisite design created originally by René Beauclair……a French architect, decorator, ceramist, ornamentalist, and painter! 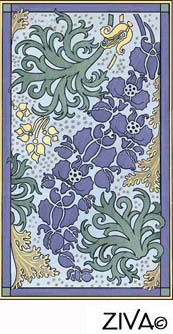 As a prolific artist, he made his reputation by publishing the very first pattern books of the Art Nouveau style in the early twentieth century. Like many artists of this period, he rejected the idea of a hierarchy-with fine art at the top and the decorative arts at the bottom-in favour of an equality of the arts so that they could all be made accessible to everyone. 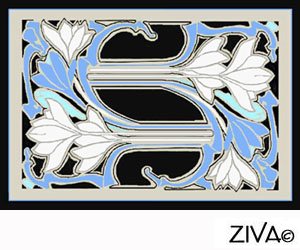 We selected one of his patterns for our ZIVA Art Nouveau Carpet Collection, called ‘Beau Beauclair’! The delicate four-petaled flowers are enveloped by curvaceous elongated leaves as the central focal point of the pattern. 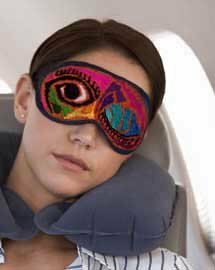 By repeating the part of the pattern on the side borders, a graceful rhythm is created. We have not changed Beauclair’s disciplined colour palette of coral-pink on the flowers, with the background motif in off-white, grey, gold, and black. After researching Art Nouveau motifs to create for you, we found the ‘CLEMATIS BUDS’ exactly as you see it! No need to change anything! 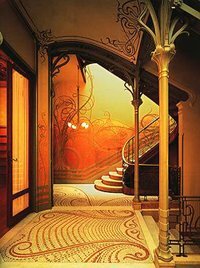 IT’S CLASSIC ART NOUVEAU ! All the design elements of classic Art Nouveau are present in this elegant design… fluid floral theme, natural sinuous contours, whiplash curves, and shapes inspired by nature. The golden yellow central background gives the impression of the blazing sun shining on the climbing clematis buds and leaves! This warm palette continues with the coral-orange and copper colours around the perimeter. With most period motifs, we usually add some warm or cool greys and/or black to update the design for today’s homes. 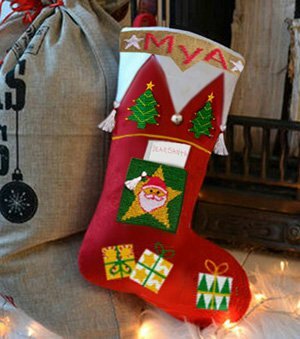 Not necessary with this motif! The cool blue-grey used on the clematis buds and on the border works beautifully as a contrast to the rest of the palette. I love how well the Clematis Buds area rug complements this modern sofa with its lovely elegant curved arms. 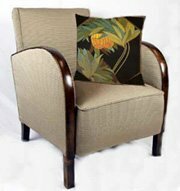 And adding one yellow cushion completes the picture! 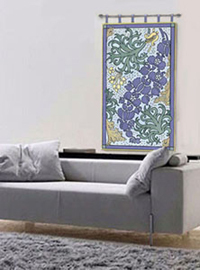 In this stylized design of the Monkshood plant, the soft mauve blossoms undulate gently from one end of the area rug to the other, balanced by the plant’s majestic leaves. 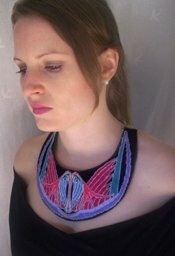 All the natural shapes are outlined with a fine black line; a Japanese-influenced effect popular in the Art Nouveau period. 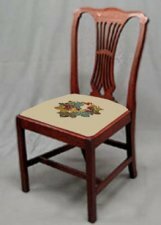 This design is ideal for needlepoint due to the textural pattern of the background and the overall detail of the motif. 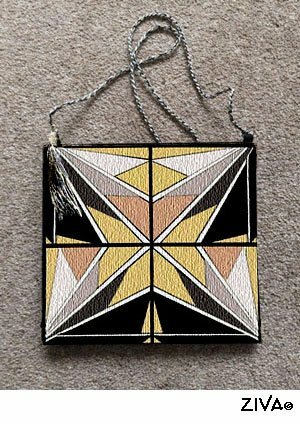 This design makes an elegant area rug, AND it would work equally well as a wall hanging! 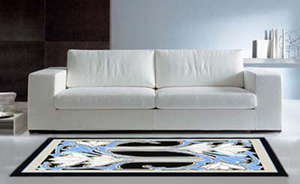 Its graceful organic motif would make a stunning accent on the wall of an ultramodern interior. Something to consider! It’s your choice how you want to make it up. 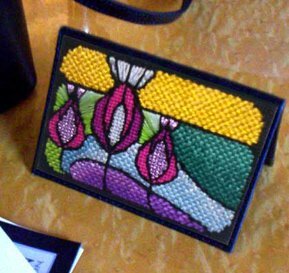 This area rug design of Lady-Slipper Orchids reminds me of Lalique’s jewellery and glassware from the Art Nouveau period. René Lalique was originally famous as a jeweller, creating fantastic sculptural orchids, dragonflies, and maidens from enamel and gold in the Art Nouveau style. 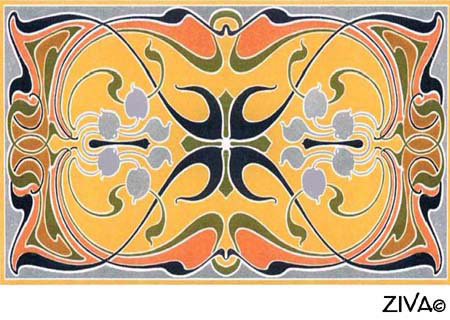 Designs for Art Nouveau area rugs wouldn’t be complete without including a reference to his genius. Although I redesigned the original motif, I’ve retained the authentic traditional colours from this period. I think they work well in a more muted contemporary interior; one with soft taupe and beige colours, and warm wood tones. The colours of light orange-red, deep rust, yellow, green, and mauve add a delicate accent to any interior, but don’t overpower it. 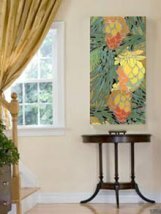 This refined, subtle design may work in your home! 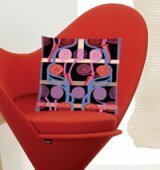 If you like the Art Nouveau style, but don’t want to stitch something as large as an area rug, why not try an ART NOUVEAU CUSHION ? 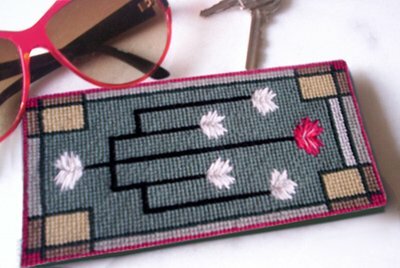 From these Art Nouveau area rugs, go back to the needlepoint carpets page to see other styles of area rugs that may work in your interior! 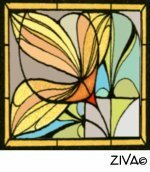 Go back to Home Page to view other designs in the ZIVA Collection.